The AlgAllure AlgaRiche Age-Defying Collection is your skin’s new best friend, designed to liberate the skin from the effects of aging by offering the ultimate in skin nourishment. PhycoDerm ® is the key ingredient in our prestige AlgaRiche™ skin care line. PhycoDerm ®, the clinically tested primary extract from our richly superior culture of marine red microalgae, when scientifically tested, exhibited significant skin rejuvenating, antioxidant, and age defying properties. 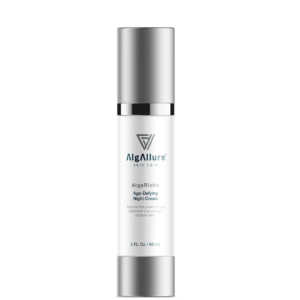 8 out of 10 women notice an improvement in the firmness and brightness of their skin, along with other diminished visible signs of aging after just two weeks of using AlgAllure skin care. *Based on consumer evaluation. Cleanse: Gently massage quarter to half-size amount of cleanser in circular motion over face, rinse. Apply Serum: After cleansing, dispense 1-2 pumps of serum in the palm of the hand, use fingertips to apply to face, neck, décolleté and massage onto face using upward strokes. Allow to penetrate into the skin for 1 to 2 minutes. Apply Daytime Moisturizer: After applying serum, dispense 1-2 pumps of daytime moisturizer in the palm of the hand, use fingertips to apply to face, neck, décolleté and massage onto face using upward strokes. Note: For optimal results, use AlgaRiche Age-Defying Cleanser, Serum & Daytime Moisturizer. Apply Serum: After cleansing, dispense 1-2 pumps of serum in the palm of the hand, use fingertips to apply to face, neck, décolleté and massage onto face using upward strokes. Allow to penetrate the skin for 1 to 2 minutes. Apply Night Cream: After applying serum, dispense 1-2 pumps of night cream in the palm of the hand, use fingertips to apply to face, neck, décolleté and massage onto face using upward strokes. 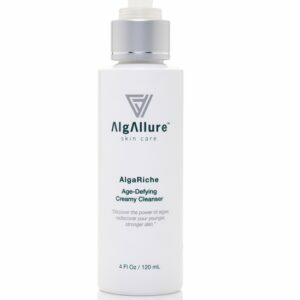 Note: For optimal results, use AlgaRiche Age-Defying Cleanser, Serum & Night Cream. For external use only. Avoid getting into eyes. Keep out of reach of children. Store in cool, dry, dark environment to prolong shelf life. The AlgAllure products are truly amazing!! I tried them one night and have been hooked ever since. They’re not lying when they say a little goes a long way – the bottles will last a long time! The cleanser is very rich and makes your face feel so refreshed, the serum is what I consider liquid gold for my face (the most algae-potent), and the moisturizer quenches your skin’s thirst in the most fulfilling way – it’s lightweight, spreads easily, not perfumey or oily, and is exactly how a moisturizer should be. If you’re looking for high quality skincare, this is it!!! Amazing review Alyssa, thank you. After using AlgAllure products after 2 1/2 weeks I can honestly say that my skin is glowing, toned and smooth. My skin was dull and had little wrinkly lines on my forehead and around my eyes. I used the day cream/night cream and serum and I have been getting alot of compliments. My skin is so hydrated and I can hardly see any more wrinkly lines. AlgAllure has truly made a difference to my skin and my life!! I absolutely love it and can’t stay with out it!!! Thank you AlgAllure!!!! Super happy and excited Sushma. Thank you. I am so grateful for being introduced to AlgAllure products. I can honestly say after trying many different products over the years and having very sensitive skin, my skin feels amazing. My skin stays hydrated and looks very smooth.! Definitely recommended! Wow! What a product! I’m 66 years old and have been switching skincare products all my life. Thanks to Algallure, I’ve finally found a regimen I’ll stick with. I didn’t believe it when Algallure promised to work on all skin types, but believe me, it does. Both of my daughters, who are in their 30’s, are using it with the same miraculous results I’ve seen. What a game changer in skincare! Thank you! Wow indeed. Thank you very much Jennie. After using AlgAllure Skin Care for 26 days, I can say I will use this product ALWAYS!!!! My skin feels/looks much healthier than it ever has!!! I love the product and that the business is in my home town, La Grange, Texas, USA. This face cream really works and is amazing on my face. I also tried it on my mom face and she loved it. I use AlgAllure Skin Care as my facial skin care routine every day and I love the feeling it leaves on my skin – smooth & glowing. Will definitely recommend to friends and family. I love the serum so much. It makes my face feel firm. The moisturizers are light weight with little scent. It’s not greasy and feels great. I love how environmentally friendly this product is as well. Overall great product that you will not regret using.